Thinking about Thanksgiving? I am, especially after already having had my first bird in Toronto last weekend for Thanksgiving in Canada. And so is Martha Stewart. 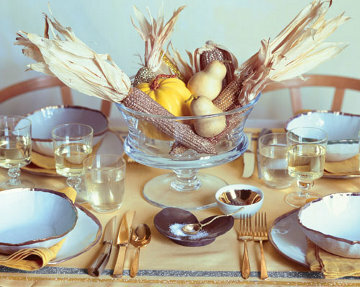 The "Golden Harvest Thanksgiving Table" includes the Berti Plenum Steak knife with oxhorn handle, Libeco Home Vence linen napkins in gold, and at the center, the large Simon Pearce Dover Footed Bowl laden with the harvest of fall. Some great ideas for decorating your table from Martha Stewart with items available at Didriks.